Rainy days and Mondays don’t always get me down. But they do occasionally give me problems getting up. Especially when I’m listening to the rain from a cosy, cabin style bedroom. Snugly, touchy feely, texture rich hideaways are the inspiration for my attic makeover which is going to be the ultimate stopover den for my friends, family and the odd runaway mum. Fancy your own duvet day den? Here’s some snugly ideas to get you started. There are lots of great timber effect wallpapers around but this this is a great value option if you’re planning on using it all over the room like I am. Quick tip - take the paper right from under the eves, up and over the ceiling for the ultimate in cabin cocoon cosiness. This look is all about the layers, so don’t fuss about pristine sheets, give yourself and the ironing board a rest. 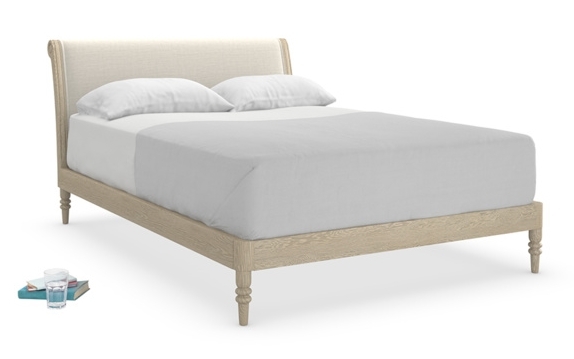 This washed linen bed set from John Lewis is duvet downtime sorted. Pile on the layers with co-ordinating - but not too matchy matchy accessories. Cabin style allows you to indulge in that oh so trendy obsession with darkness, but getting the lighting right becomes all the more important. I fancy adding in some silky metallics and this copper Axial pendant makes the perfect focal point. Since that’s taken out a big chunk of my lighting budget I’ll be looking for great value table lamps such as these copper house lamps by BHS. And my favourite Autumn supermarket find, this glass bell light from Asda. You won’t be needing much luggage when you come to stay in my cabin hideaway because, let’s face it, you won’t want to get out of bed. But a trunk load of glossy magazines and fabulous books will help your recuperation process a treat. Those people at www.loaf.com know all there is to know about rest and relaxation and will wholeheartedly encourage you to pack up all your troubles in this Clyde storage box and head off back to bed. Preferably one like my darling Darcy bed, which if you’ll excuse me is where I’m heading now. See you in the Spring?